In the early days of social media, small businesses used the various social media platforms to gain a nimble David advantage over their Goliath-sized competitors. But as social media quickly matured, the early mover advantage of smaller firms eroded. Social media now requires real business resources and many small businesses don’t have the people and money to keep up. Small business social media has reached a tipping point. To understand how the current social media landscape applies to your small business. 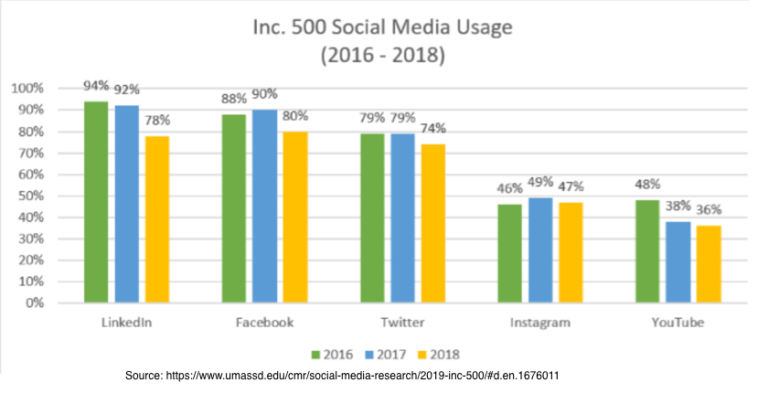 Examine these 5 key takeaways from the UMass Dartmouth 2019 Inc 500 Social Media Research. Follow these 10 actionable small business social media tactics. The UMass Dartmouth has consistently monitored social media use by both the Inc 500 and Fortune 500 over the last 12 years. As a result, it provides useful longitudinal information. In addition to analyzing external factiors, UMass Dartmouth performed 112 phone interviews or about 20% of the list. Of these interviews, just under half had sales between $3 and $11 million dollars. 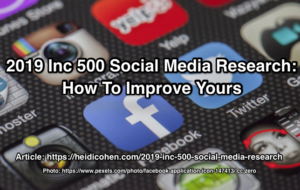 At first glance, the UMass Dartmouth 2019 Inc 500 Social Media Research results show little change from 2018. But deeper analysis revealed these 5 key research findings. Specifically, 94% of small businesses use some form of social media. Since most people and businesses use social media, expect new or additional user growth to remain relatively flat. Marketers regardless of business size need to use social media since they must be where their potential audience spends their time. 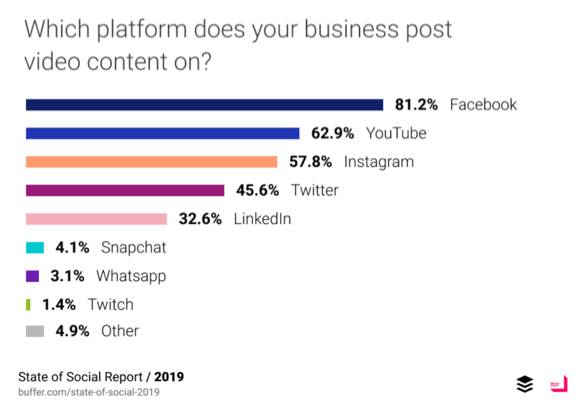 Despite usage falloff of roughly 10 percentage points Facebook and LinkedIn remain the top social media platforms for small businesses. No surprise since Facebook combines mass audience with deep knowledge about their participants. And LinkedIn facilitates professional relationships, sales and related content. While Twitter usage hasn’t dropped as much, UMass Dartmouth interviews revealed that executives feel that Twitter doesn’t provide sufficient results. YouTube usage remained relatively flat. By comparison with other platforms, YouTube only uses video and advertising. UMass Dartmouth didn’t comment on small businesses use of video on social media platforms. Further, UMass Dartmouth includes blogs as part the social media mix. roughly half of small business have a blog. Blogs rank higher usage than Instagram and YouTube! While small businesses tend to be less formal, a social media strategy keeps your organization focused on your core goals. Further for small businesses this lack costs money since it may not be clear to your employees what needs to be done. Similarly over the years, Content Marketing Institute/MarketingProfs’ research has shown that businesses resist documenting their mission statements and strategies. As a result, their performance tends to be lower. Marketing success often applies to a series of efforts and processes that can be difficult to track over time. Further, you need specific tracking built into your marketing and methods for collecting and analyzing it. Beyond specific freelance, agency and media expenses, assessing and attributing employee time and other business overhead can be difficult. Social media accounts for 12% of marketing budget, But expenses can vary significantly. Looking forward, the key to social media budgets when funds are tight is not the amount but where it’s spent and how well it works with other elements of the marketing mix. Based on the UMass Dartmouth Research, small business executives don’t have a fully realized approach to marketing. They’re focused on elements with outside price tags. Small business content marketing and search. Social media doesn’t work by itself. At a minimum, invest in tools to review what’s happening and being said on social media platforms that’s related to your business. Beyond your company, brands and products, check on customers, competitors, suppliers and distributors. This includes influencers and the major players. Determine if there are problems you need to respond to. Find opportunities you can take advantage of. Regardless of where you focus your social media resources, maintain and extend your brand in your names and profiles. To this end, incorporate social media into your brand guidelines. While many small businesses think branding is only for big corporations, you need it more. Since consistent branding keeps your organization visible and it reduces decision making and creative resources. Claim your business name across platforms. Even if you don’t intend to invest time on other platforms, use your profiles to direct your audience elsewhere. Keep your social media branding consistent. This includes your images, typeface and voice. Yet smart entrepreneurs and solopreneurs need to constantly stay on the lookout for opportunities where they can stand out. Beyond outposts on the major platforms, check smaller or niche platforms to take advantage of growth opportunities. Participating on these platforms helps you to become part of their community and supports your content distribution. For example, Scott Monty curates his weekly newsletter, The Full Monty, using Flipboard. Blogs require time and resources as shown by Orbit Media’s Blog Research. If you integrate your blog into your website, you have an owned digital homebase. With care and nurturing, a blog can support building your email list and search. Even better it supports your customers. Go back to Marcus Sheridan’s they ask you answer. Provide the information your customers actively seek. Further, a blog integrated into your website can easily use Google Analytics to provide usable data. Additionally make sure that your blog provides on-ramps to further engagement including, Email Registration, Contact Us, and About Us. This data does show the power of video. But this visual format remains white hot. Further video is part of Facebook, LinkedIn and YouTube. Unfortunately, the UMass Dartmouth data doesn’t discuss social media video, but it remains white hot. Furthermore, it can be used across platforms. Although video can be expensive, tap into live streaming and other low-cost video options to talk to your audience and provide answers to their purchase related questions. Define what you want employees to do on social media to support your business. Get their permission to support and advocate for your business on social media. To this end, make sure that their values and goals are aligned with yours so that they buy-in to this activity. Provide employees with the training and tools they need to participate on social media. Keep employees informed. Don’t assume they know what’s going on.. Further make it easy for everyone to post and use consistent branding. Set and share your organization’s social media guidelines. Make social media participation part of their job description. With increased privacy and data protection concerns establish a set of steps to minimize damage from hacks and other challenges to your online reputation. Step away from your devices and cool down. Take a deep breath without worrying that you’ll make the situation worse. Have a list of employees and their mobile phone numbers who need to be in the loop and participate in any decisions. Have external resources lined up including a PR firm to help with damage control and a lawyer. A crisis isn’t the time to start thinking about how to find someone. Executives believe that social media works but they still can’t track results. So they fall back on brand awareness and other easy-to-track metrics that don’t necessarily yield an addressable audience, leads or sales. If you don’t set your marketing up to yield measurable results you won’t get any. At a minimum, use a call-to-action and include tracking to start measuring results. Further while you must start with what you can measure, move to metrics that enable you to assess the value of your marketing. In some ways, small businesses have an advantage over more established organizations. They aren’t locked into existing systems with limited and time consuming ways to track results. Regardless of the size of your business, you need a social media roadmap to guide you. While strategies seem like management overhead, with limited resources, each decision is a defacto tradeoff. More importantly this strategy must be integrated into your overall business and marketing plans. To be effective your social media strategy must have measurable goals. Social media is no longer something you do on the side. To maximize your social media effectiveness and reduce costs, it must work with the other elements of your marketing and business. This includes content, search and sales conversion. For small businesses, social media requires a documented strategy aligned with your business objectives. Further your social media activity must be integrated with the rest of your marketing and sales plans. To improve your social media results, incorporate tracking where possible. Also, test different presentations and content formats. As a result, you must integrate your social media activity into your overall marketing and business plans to get measurable results. Tags Inc 500, Research, UMass Dartmouth. Bookmark the permalink.